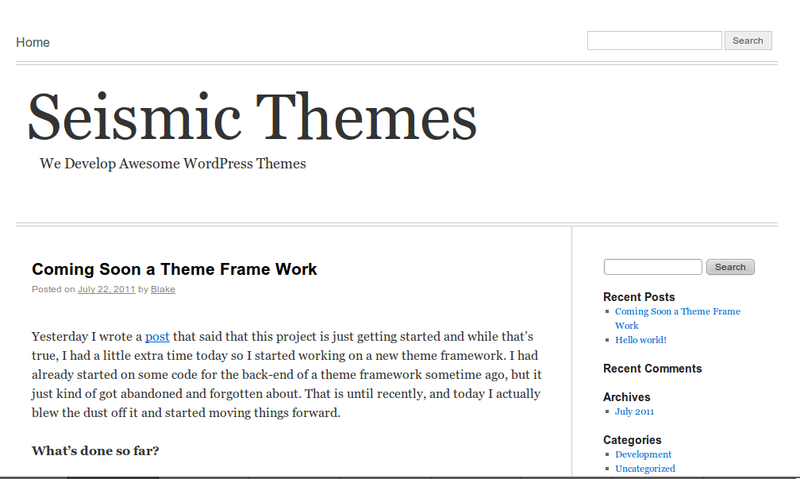 So last night I had mentioned that I had started working on a new theme framework for WordPress, before writing that post I had been thinking about whether or not to release a the whole thing for free or just a free version of it. Then after writing that post I came to the conclusion, I would build a totally separate but equally beautiful theme, that I would release freely, it’s not quite done yet but once it gets there I will submit it for inclusion on the WordPress theme directory. So far I have built in a custom background, custom header image, and custom header text color, and you can totally remove the header text if you would like. It also supports a custom menu with drop-downs, I initially built a version that had the option for two menus I still have that but have been moving forward with the single menu version. It’s a pretty standard and straight forward 2 column layout with the content on the left and the sidebar on the right. I have some other style sheets that I have been working on which will allow you to place the sidebar on the left and the content on the right. It incorporates primary and a secondary sidebar widgets, which will also enable a 3 column layout which I also have a style sheet drawn up for. I haven’t decided if I will just include those file in a folder called CSS, and than just include directions for how to use them, or if I will put together a theme options page that will allow switching between them with the click of a button. I like the later option the best but, it might be rather hard to get it to pass the directory theme requirements in that state, because of the theme root directory style sheet requirements. I’m not real sure about this though it’s something I would have to look into a little farther before making a final decision. The current theme of this site (as of 22 July 2011), is running on a very early version of this theme, although there is still quite a bit of work to be done on the back end. I am very excited about getting this theme completed and released to the public, so I’ll be spending quite a bit of time working on it this weekend. If you have any questions or comments about this theme, please feel free to leave them below.